I am keeping it real here today. When I was at the SNAP! Conference, I sat in on a session about adding texture, color and design to rooms. One of the speakers was Cynthia Bee from Utah Garden Blogs (Doesn’t she have the best name ever for a gardener?! Love it!) She showed us all that we could do with plants, specifically, terrariums. She has a “how-to” post on her blog. I came home from the conference determined to plant some terrariums. 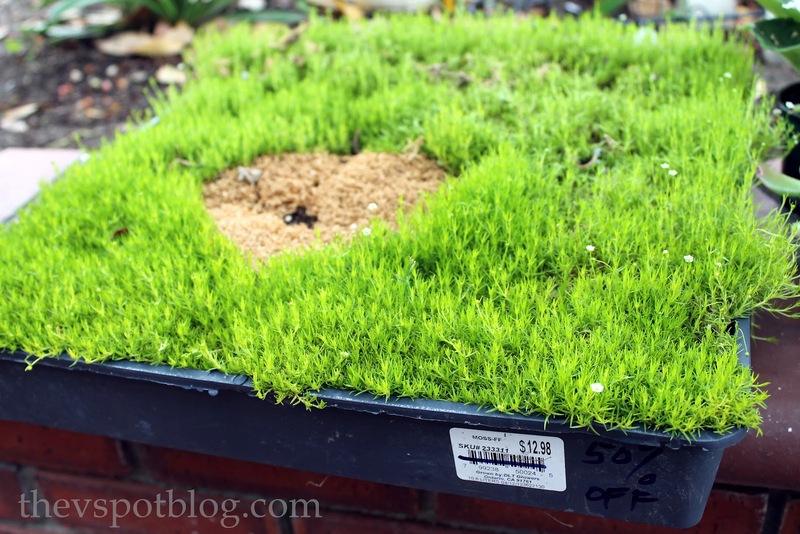 I ran to Lowe’s to buy some moss. I bought some activated carbon and aquarium gravel at the pet store, I gathered my glass containers, apothecary jars and cloches…. and went on a terrarium planting spree. I was going to take photos of my beeeeeeee-you-tiful terrariums, and do a post about them, but I was out of town for a few days and figured I do it when I returned. Um, it was NOT pretty. Cynthia Bee told us to use activated carbon and hers was in powder form, but the guys at the pet store told me pellets would work. I think I should try powder. I also wonder if the Irish moss that I snapped up at a bargain had the gnats already in there and then I brought it into my house. My containers might have been a bit too small. I must not have followed the directions well enough, (I sometimes just skim them and jump in) so I’ll be giving this another try. I really think they look cool, and I love the idea of only watering it every once in a while. Here’s another link that inspired me over at Miss Kopy Kat. Worst case scenario…? As much as I would hate to, I might have to buy one. Ha, oh NO!! That worries me because I made my mom one for Mother’s Day and it was so pretty, so I made one for us too. So far so good though but I hope they don’t do this! I didn’t use activated carbon or anything either. Just some terrarium soil and rocks. Hope that will work. Sorry girl. I love the look of terrariums, and really anything under a cloche. Anxious to hear how round 2 goes! I got all excited and made like 5 terrariums last year. None of them made it 🙁 I had the same problems. I gave up! I make terrariums for gifts but I usually plant a little Bromeliad or another plant. I use charcoal, gravel and a little sand. I use a spray bottle to add just a touch of water and most of mine are closed lid (except for cactus). Keep trying because once you get it right these are the best gifts for every occasion ! Yeah, I made an terrarium a couple of months ago. It is now hiding in a closet. I’ve been wanting to make one of these but haven’t had a chance yet! It looks like the slimy plant is an African violet? If so, they despise getting their leaves wet, and they like their dirt fairly dry. 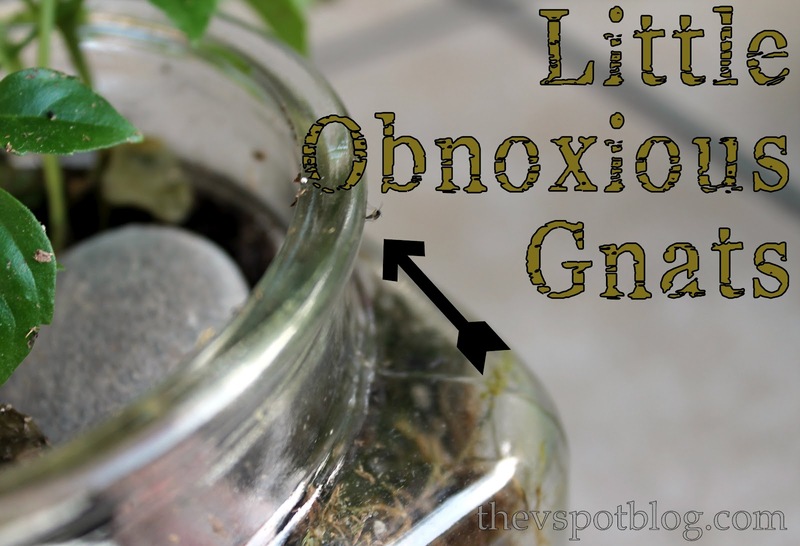 I hadn’t thought about a gnat problem, but they can totally be attracted to moist dirt. Maybe make a terrarium you can enclose? Let us know how it goes! I love them too..hope yours works out. Is it bad that it makes me a little happy when mrs crafty genius has a little crafty fail. Oooohhh that was bitchy huh. hee-hee I kid I kid. I just saw this post! First off, do try it again. I would make sure to sterilize your jars first. Secondly, make sure to take the lid off frequently- everybody loves air circulation. My guess is that the media was too wet which is a really easy problem to have. I have solved it by watching the condensation patterns. If there are little droplets of water on the lid but not the sides- that is ideal. If the sides fog up, there is too much water in the terrarium. If no condensation at all is occurring, time to water with a teaspoon or so of water. You can also try watering with a solution of 97% water, 3% hydrogen peroxide and see if that helps! Sorry didn’t see your post sooner. Don’t give up! The Atlanta TSA stole my son’s yo-yo.